As a makeup artist, I am always on the hunt for new brushes. That's why I'm constantly looking for new ones to join my collection. 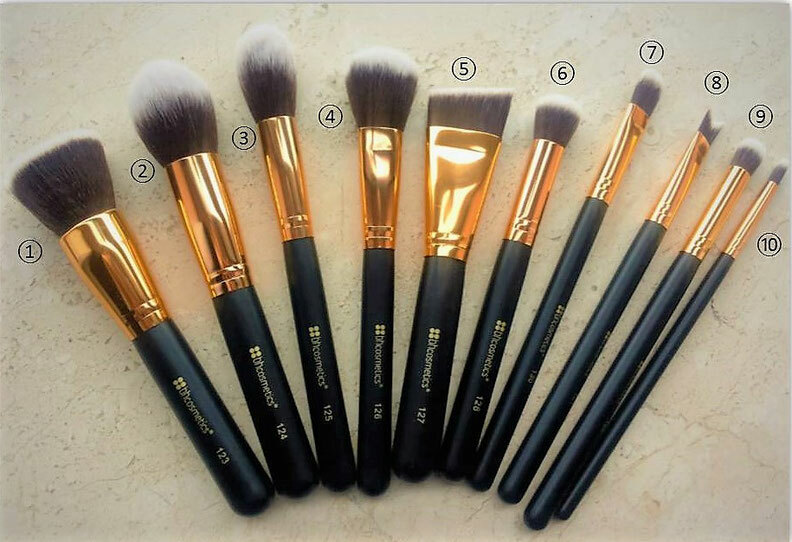 At the beginning of the year, I ordered the BH Cosmetics Sculpt and Blend 2 - 10 Piece Brush Set online. Here are my thoughts. BH Cosmetics was founded in 2009. They kick-started their business with eyeshadow palettes. Since then they have extended their product range to lip, face and makeup brush lines. The set comes in a cardboard box with an image of the brushes printed on it. Inside they are wrapped in clear plastic. All brushes have black handles and golden ferrules. They are numbered consecutively from 123 to 132. The set includes five larger and five smaller brushes. 123 is labeled as a flat top buffing brush, 124 as a tapered face blending brush, 125 as a tapered contour brush, 126 as a precision blush brush, 127 as an angled face shader brush, 128 as a small deluxe blending brush, 129 as a small round blending brush, 130 as a large shader brush, 131 as a nose contour brush, and 132 as a precision detailer brush. According to the product description, this is a multifunctional brush set. 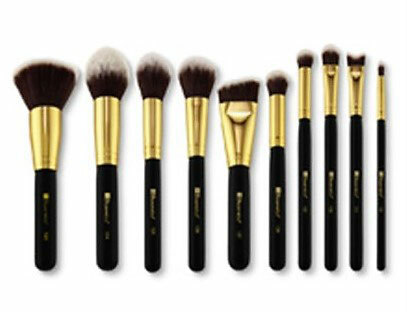 The 10 synthetic dual fiber brushes should be suitable for eye and face applications. Furthermore, the brushes are supposed to work with creams, powders, and liquids. The fibers of the brushes are very soft. After cleaning them, several times, they remained their softness and shape. So far there has been no shedding. In my opinion, the majority of the brushes are for face applications. I only use the precision detailer brush (no. 132) for the eyes. It works perfectly for tight lining, blending the lower lash line, and to achieve a precise cut-crease. The other three smaller brushes (no. 128-130) are a touch to big for working on the eye, especially for makeup beginners. No. 130 is great for applying cream products to the face. And 128 /129 work very well for blending out harsh lines and around the nose. They are too dense to blend out eyeshadows. I prefer fluffier ones to do the job. My favourite brush of the set is no. 125. The tapered contour brush makes contouring quick and easy. It puts on the product and blends it at the same time. The same goes for 124 and 126. The flat buffer brush (no.123) is a standard foundation brush which works just fine. I was really curious about no. 131, the nose contour brush, because I never saw nor used such a brush before. I am not completely sold on this one for three reasons. First, you can only use it for the tip. Then it takes some time to get the hang of it. And finally, you can achieve the same result with the other brushes in this set. The only brush that didn`t work for me at all was no. 127. I tried it several times, with different products, but never liked the outcome. I find the shape makes it hard to apply products evenly on the skin, especially powder products. Pricewise the set is a winner. I paid 22€ in total, meaning only 2€ per brush. Considering the great quality of the brushes this set is a bargain. As promised, they work with creams, powders, and liquids. For this price, you get everything you can ask for to cover all your face application needs. In contrast to the product description, I don`t think this set works for the eyes and the face. Just no. 132 really works for eye applications. Furthermore, the brushes no. 127/ 131 aren´t necessary for the set. You can achieve everything with the other ones. Would I recommend buying the set? Definitely! I think this is a good set to start with but also a great addition to any makeup brush collection. Do you know this set or any other products of BH Cosmetics?